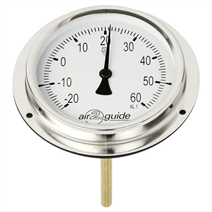 The model A2G-61 analogue ventilation duct temperature sensor with analogue display is used for monitoring the temperature in ventilation systems. The temperature sensor is available in the probe lengths 100, 160, 200 and 300 mm. The NBR sealing, which is included in the delivery and already mounted, enables direct, leak-free mounting to the ventilation duct.